Who Really Benefits from Revolutions? I am a little reconciled to the theatre. [...] and as all the properties have changed masters, the actresses have no end of diamonds. Why Were the French Revolutionary Wars Fought? The French Revolution had introduced liberal thoughts regarding equality, rights, and liberty. The French Revolutionary Wars were fought in order to spread, or to prevent the spreading of, the spirit, the ideas, and the achievements of the French Revolution. When Did the French Revolutionary Wars Begin? The French Revolutionary Wars started when France declared war on Austria on April 20, 1792. In fact, this was the beginning of the War of the First Coalition, the first phase of the French Revolutionary Wars. Check this event in the timeline of the French Revolutionary Wars. 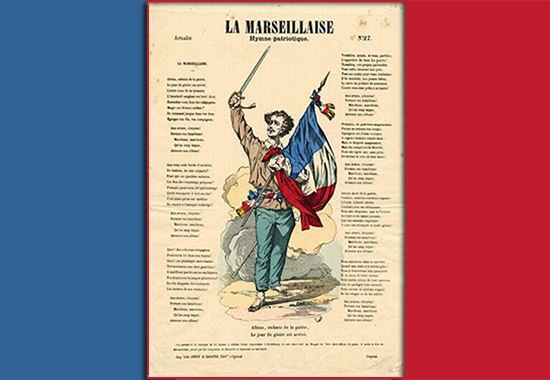 La Marseillaise is the French national anthem, composed in just one night during the French Revolution, on April 24, 1792, by Claude-Joseph Rouget de Lisle. At the time, De Lisle was an army officer stationed at Strasbourg. 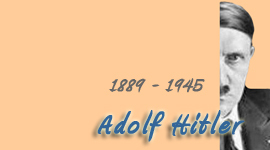 He composed both, lyrics and tune. The original title of the song was Chant de guerre de l'armée du Rhin, in other words, War Song of the Army of the Rhine. It became the Marseillaise when volunteers from Marseille couldn't stop humming it. What Ended the French Revolutionary Wars? The French Revolutionary Wars ended with the Treaty of Amiens in March 1802, a peace treaty between France and Britain. Some mark February 1801 as the end of the French Revolutionary Wars when the Peace of Luneville was signed. 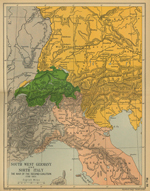 This was a peace treaty between France and her main enemy, Austria. The War of the First Coalition was fought from 1792 to 1797. 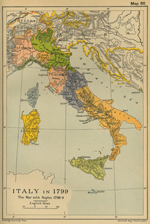 Napoleon's First Italian Campaign was part of the War of the First Coalition. The Wars of the Vendée were fought from February 1793 to July 1796. 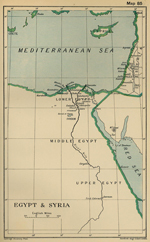 Napoleon's Egypt Campaign was in operation from 1798 to 1801. The War of the Second Coalition was fought from 1798 to 1802. Here is more on the seven Coalitions that were formed to fight against revolutionary France. 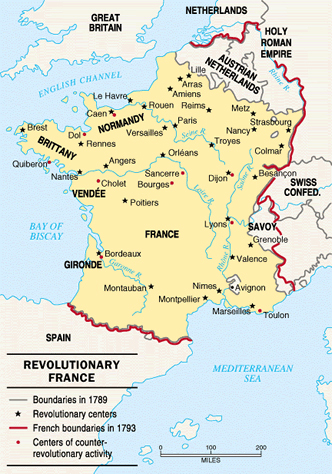 By means of the French Revolutionary Wars, France carried the French Revolution beyond French borders. One of the methods to establish, and to keep, French revolutionary thoughts alive outside of the French Republic, was to set up so-called sister republics. April 20, 1792 France declares war on Austria. This marks the beginning of the War of the First Coalition. The French Revolutionary Wars begin. April 29, 1792 France invades the Austrian Netherlands. August 10, 1792 France is now a republic. September 20, 1792 Battle of Valmy. French victory. End of November 1792 The French have occupied all of the Austrian Netherlands / Belgium. January 21, 1793 Trial and execution of Louis XVI at Paris. February 1, 1793 France declares war on Great Britain and the United Provinces. Europe is now almost completely entangled in the War of the First Coalition. February 20, 1793 The Wars of the Vendee begin. March 1, 1793 Austrian counter-offensive begins. Battle of Aldenhoven. Austrian victory. August 23, 1793 The French National Convention orders a mass recruitment. June 26, 1794 Battle of Fleurus. Important French victory. 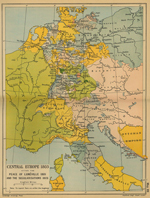 For the next twenty years, France, instead of Austria, will occupy the Low Countries. 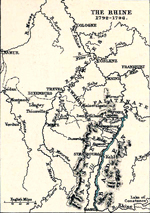 April 5, 1795 Peace of Basel - Prussia accepts the Rhine River as the French eastern border. 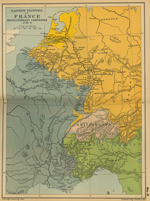 France won the War of the First Coalition against Prussia. One ally down, four more to go. 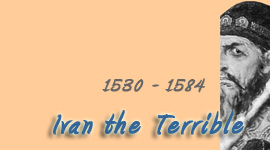 May 16, 1795 Batavian Republic proclaimed. June 27, 1795 Battle of Quiberon Bay. Victory for French revolutionaries over French royalists and their British supporters. 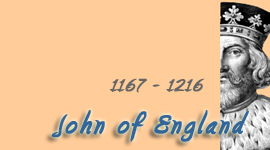 This battle was part of the Wars of the Vendee. March 2, 1796 Napoleon is appointed commander in chief of the Army of Italy. July 1796 The Wars of the Vendee end. April 17, 1797 Treaty of Leoben. This agreement was a draft of the Treaty of Campo Formio (October 1797,) confirming French victory in the War of the First Coalition. 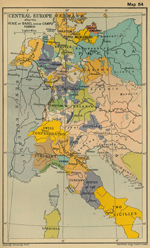 September 4, 1797 Coup d'état of 18 Fructidor, year V.
October 17, 1797 Peace of Campo Formio. France won the War of the First Coalition. The War of the First Coalition ends. May 19, 1798 The Egyptian Campaign begins. August 1, 1798 Battle of the Nile British victory over the French. This battle is part of the Egyptian Campaign. September 11, 1798 The Ottoman Empire declares war on France. November 29, 1798 Troops from Naples enter Rome and evict the French. This marks the beginning of the War of the Second Coalition. March 17-20, 1799 Abortive Siege of Acre by the French. This battle is part of the Egyptian Campaign. April 23, 1799 Congress of Peace at Rastatt (Rastatter Friedenskongress) ends. 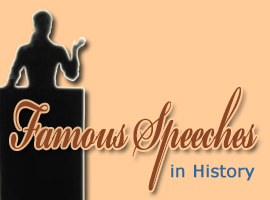 This congress had commenced with its first session on December 9, 1797. June 4-6, 1799 First Battle of Zurich. Austrian victory. September 25-26, 1799 Second Battle of Zurich. French victory. November 9, 1799 Napoleon Bonaparte comes to power via coup d'état (Coup d'Etat du 18 Brumaire, year VIII) that overthrows the Directory and installs the Consulate. He is now First Consul of France. This marks the end of the French Revolution. June 14, 1800 Battle of Marengo. French victory. December 3, 1800 Battle of Hohenlinden. French victory. April 2, 1801 Battle of Copenhagen. British victory. February 9, 1801 Peace of Luneville. France has defeated Austria and is the leading power in Europe. July 15, 1801 Concordat of 1801 between France (Napoleon) and the Vatican. September 2, 1801 The Egyptian Campaign ends. The War of the Second Coalition ends. The French Revolutionary Wars are over. And here is a chart of the French armies from 1791-1802, their creation, their commanders, their timeline. What Happened After the French Revolutionary Wars? Once the Revolutionary Wars had been fought, the Napoleonic Wars came next. In 1799, Great Britain became the first country to charge a general income tax. The tax was imposed to pay for Britain's participation in this war. Income Tax was announced in 1798, and introduced in 1799, as a means of paying for the war against the French forces under Napoleon. 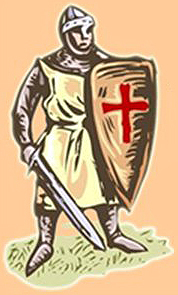 France was threatening to invade, and had already landed briefly in Wales and Ireland. For much of his campaigns from 1795, Napoleon was better organised than the British forces. The cost of war had drained Britain’s resources, and run up a considerable national debt. The army was starving, and poor conditions in the navy in 1797 had led to mutiny. William Pitt the Younger was Prime Minister and Chancellor of the Exchequer from 1783, and needed greater ‘aid and contribution for the prosecution of the war’. ‘Certain duties upon income’ as outlined in the Act of 1799 were to be the (temporary) solution. It was a tax to beat Napoleon. Income tax was to be applied in Great Britain (but not Ireland) at a rate of 10% on the total income of the taxpayer from all sources above £60, with reductions on income up to £200. It was to be paid in six equal instalments from June 1799, with an expected return of £10 million in its first year. It actually realised less than £6 million, but the money was vital and a precedent had been set. 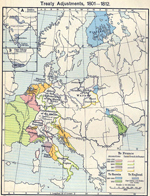 This map here is of Central Europe in 1797 after the Peace of Basel and of Campo Formio. The Treaty of Campo Formio was signed on October 17, 1797, after Napoleon had defeated Austria in his first Italian campaign.